Dancers at the ŻfinMalta Masterclass last Saturday. Last Saturday, I was fortunate enough to observe a superb masterclasses organised by ŻfinMalta as part of their ongoing collaboration with Valletta 2018. This masterclass is part of the IMMERSE category of the dance company’s Education and Outreach programme, and thus it was aimed at dancers who aspire to become professional or semi-professional. The dance studio at the University Dance Studios in San Gwann was packed with dancers from different schools, all eager to learn something new. Part of the masterclass included learning a choreographed piece from ŻfinMalta’s upcoming production Je Tiens La Reine. The intensive masterclass lasted for two hours and was divided into three parts with three dancers from the company – Christina Aquilina, Kostas Papamatthaiakis and Martina Zammit – handling a particular section. 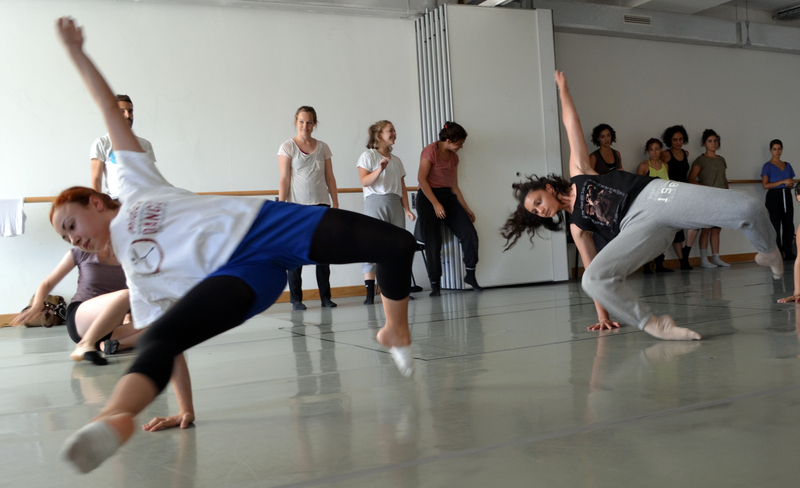 Martina started off the session with a contemporary dance class. The students, ranging from intermediate to advanced levels, followed her lead; their bodies going through a flurry of movements with arms elongating, legs rising, bodies curling into balls, heads turning, and other movements which they all made seem easy and effortless but which might prove to be quite strenuous for anyone else who isn’t a dancer. After they went through the whole routine once, they had to repeat it again and again. By some form of muscle memory, the dancers instantly repeated the whole routine perfectly, after just one take. Sandra Mifsud, ŻfinMalta’s Creative Development Co-ordinator, explained that this is essential. “It is very important for the brain and the body to be connected,” she explains. Kostas took over after Martina with an improvisation-led class. He went through the more abstract part of the class – the creative process of dance. Here, he told the students to focus on body parts, the spaces between them, and how to exploit these spaces to create movement. By making the dancers aware of that particular area of the body and the space that it can expand and reduce, the students were not only made aware of their movements, but they also imbued these movements with intention – I need to move arms apart to expand the space between them, as this is what is required, or I need to bring my legs closer together to remove space. Kostas explained different ways to move the body, for example, grasping at a number of invisible strings to experiment with different movements. Since this part of the class was more improvisation, there was a sharp contrast between the dancers’ movements where some were moving slowly and gracefully while others were performing rapid, almost violent, movements. The disparity in movements is actually quite interesting as it presents the two extremes of motion that the body can produce and incorporate within dance. ŻfinMalta dancer Kostas Papamatthaiakis leading the improvisational part of the session. The final session was led by Christina, who was handling the repertory part of the masterclass. In the final part, Christina demonstrated part of the choreography from the upcoming Je Tiens La Reine production. She then divided the class into three groups, with each group taking a turn at practising the choreography. Like Martina’s session, the dancers almost all got the choreography down instantly. Such masterclasses are interesting to observe as you get to appreciate the thought and the effort that goes into a choreographed dance. It makes you think that movement isn’t random. On the contrary, it’s intentional, and from movement, artistic choreography is forged – poetry written using bodily motion. From that little taster during the masterclass, I’m quite certain that the Je Tiens Le Reine production will blow people away. This production will be on at the Argotti Gardens in Floriana on the 15th and 16th July as part of the Malta International Arts Festival.